Masters Summit @ Milan: The dream team will be offering new workshops with the Qlik platform in one of the most iconic cities of the world… Am I the only one excited? Deploying more projects with QlikView and R: I’ve been working in small apps that mix QV with machine learning, predictive models and text mining in R and the results have been amazing (more posts about this topic in the following weeks). However, I’m pretty excited about implementing them in large scale. Seeing how Qlik Sense evolves: I have to admit that my inner System Administrator fell in love with Sense from the very first minute. However, as a developer, data analyst and especially as a designer, I think that it still has room to grow. Nevertheless, I’m eager to see how this platform matures. I think 2016 will be a crucial year for Sense. C’mon, maybe even Leo might get an Oscar this year! But anyways, on to the post. 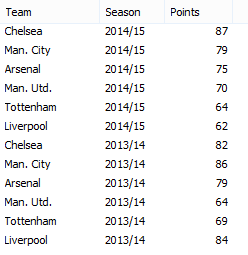 Today’s data set is pretty simple, we have the best 6 teams of the Premier League and how many points they scored in the last two seasons. The idea is to display the rankings of both tournaments and highlight the movements between them. [Download all the materials here]. Even though the number of points is a valuable metric by itself, the way this competition works makes the rankings (the way one team compares to the rest in the current season) more relevant. For instance, let’s focus on Arsenal for a minute. As you can see, even though they scored less points in the most recent tournament (75 against 79 from last year), they improved their position by going from the fourth to the third place.